The Travis Kelce show took a detour against the Vikings when Anthony Fasano got the majority of the targets with the first team. Second year running back, Knile Davis, has good hands, nice leg drive, and uses a stutter stop and start to get past defenders. He is no Charles though, even with a few spins and forward lean. 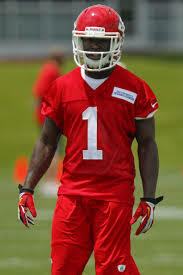 Rookie offensive weapon De’Anthony Thomas seems to be used as a distraction with a few trick plays here and there. He has great burst combined with good downfield vision which makes his very dangerous in space. Unfortunately, Thomas is so small that I’m not sure if he can hold up with more than five touches a game. Breakout wide receiver Cordarrelle Patterson gets behind the defense, tracks the ball well in the air to score a long touchdown that looked effortless. He can swat defenders out of his way, but still falls to a few concentration issues from time to time. Rookie running back Jerick McKinnon took a back seat to Matt Asiata this week. The rookie has soft hands, good balance, but runs better outside. I hoped he would win the backup job outright with his athletic gifts over the plodding Asiata, but it might take the season for that to happen. Teddy Bridgewater got into the game with less than three minutes in the third quarter, but made an impact none the less. The rookie quarterback found his tight end twice on short drags for touchdowns before the start of the fourth quarter. The Bears defense was on roller skates. They reacted, instead of trying to enforce their will on the Seahawks offense. Alshon Jeffery and Jay Cutler needed a quarter to start to get on the same page. The receiver needs to get better securing the ball as he let one get stripped out of his hands near the end zone. Rookie running back Ka’Deem Carey appears to be thinking on every play instead of running the play. He looked better on screens than runs, because the back was already in space. If Forte goes out, Carey will struggle to perform at more than 70% of the starter’s level. If the preseason gave out superstar awards, Russell Wilson would be leading the charge. The quarterback is confidently throwing the ball down the field, running when his receivers aren’t open, and makes very quick decisions. I love the way he uses the bootleg to run or pass. Percy Harvin appears healthy with his explosion back, returning, and catching passes in space. If or should I say when Mr. Skittles leaves, Robert Turbin and Christine Michael seem ready to provide a nice one-two punch. Turbin slides off tacklers and takes what the offensive line provides; while Michael runs over, jumps away from, or simply runs through any defender in his way. The Rams had great drama with the season ending injury to Sam Bradford, but that wasn’t the biggest surprise for them. Bennie Cunningham received the start at running back and looked good carrying the rock. He runs low with power, and uses his quick feet to exploit open running lanes. Both Brian Quick and Kenny Britt looked like starting NFL receivers by shielding the ball, catching it at the highest point, and running crisp routes. The Rams defensive front four flew off the ball, disrupted running and passing lanes and harassed Browns quarterbacks all night. Rookie defensive linemen Aaron Donald and Michael Sam might not be starters, but they continue to apply pressure when they are out there. On the Cleveland side, it is hard to get excited about Brian Hoyer. He stared down his receivers, doesn’t feel pressure, and does not look comfortable. Ben Tate ran hard with power looking like the starter, for now. Rookie runner Terrence West came in third. The back has quick feet, good balance, and wiggle. Despite the number of carries Tate got in the preseason, I still expect West to be the starter before Thanksgiving. New to the Browns receiver, Andrew Hawkins looks great on a bubble screen and can create space with tight coverage. He probably will lead the team in targets, but might average less than seven yards a catch. Rookie Hall of Famer, Johnny Manziel, was very excited when he came out in the third quarter. He got too much air on his passes in the red zone, but rebounded with a scramble for a touchdown. The Titans rookie running back, Bishop Sankey, didn’t get into the game until the third quarter. He dances a bit too much at times, but can squeeze through a small opening to get to daylight. It’s going to take him time to get to the starting lineup. Second year receiver Justin Hunter catches the ball at its highest point, but let his coverage move him around, knocking him off course. The wide out is slippery in the open field, has good concentration, but lacks power to get away from tacklers. Atlanta has a beastly linebacker in Paul Worrilow. He flows well to the ball, sheds blockers quickly, provides pressure up the gut, and is a great tackler. He should lead the Falcons in most defensive categories this season and beyond. Former Bear and special team specialist Devin Hester looks a bit reborn in the Atlanta offense. He is still an explosive returner, but is now using his wiggle/quickness in four receiver sets. Rookie runner Devonta Freeman continues to get carries as the third back. What I love about him is his second effort, it doesn’t matter if he is carrying the ball or blocking downfield after a teammate makes a catch. Freeman keeps on going until the whistle blows. It may take him the better part of the season to get meaningful touches, but they will come. Do you like the site? Please support my efforts with a little PayPal love. Follow me and the site on Twitter @AndrewMiley and/or @Dynasty_Blitz. Thanks for reading.